Finally, after five years of debate IFRS and the US’s FASB have agreed on definition of ‘Fair Value’. Although it does not change what is measured at fair value in IFRSs or address how to present changes in fair value, it is still beneficial for all the accounting people to know that IFRSs and US GAAP having the same definition and meaning of fair value and the same disclosure requirements about fair value measurements. Under IFRS, the new standard is known as IFRS 13 and gives companies a precise definition of fair value for the first time. For GAAP users, the standard updates and clarifies the existing fair value measurement rule under Topic 820. With the new rules, the boards have agreed that fair value should be measured by using the price in the principal market for a particular asset or liability, or if no principal market exists, the most “advantageous” market for it. It also standardizes the hierarchy for the Level 1, 2, and 3 categories, that classify the level of judgment used in measuring particular assets or liabilities at fair value. Level 1 – Quoted prices in active markets for identical assets and liabilities. Level 1 inputs must be used without adjustment whenever available. Level 2 – Inputs not included within Level 1 that are observable for the asset or liability, either directly or indirectly. Fair value is measured using the price in the principal market for the asset or liability (i.e. the market with the greatest volume and level of activity for the asset or liability) or, in the absence of a principal market, the most advantageous market for the asset or liability. Detailed guidance for measuring the fair value of liabilities, including a description of the compensation that market participants would demand to take on an obligation. Financial assets and financial liabilities with offsetting positions in market risks or counterparty credit risk can be measured on the basis of the entity’s net risk exposure. Classes of assets or liabilities for disclosure purposes are determined on the basis of the nature, characteristics and risks of the asset or liability and the level of the fair value hierarchy (ie Level 1, 2 or 3) within which the fair value measurement is categorized. A narrative discussion is required about the sensitivity of a fair value measurement categorized within Level 3 of the fair value hierarchy to changes in significant unobservable inputs and any interrelationships between those inputs that might magnify or mitigate the effect on the measurement. In addition, a quantitative sensitivity analysis is required for financial instruments measured at fair value. Information about an entity’s valuation processes is required for fair value measurements categorized within Level 3 of the fair value hierarchy. That disclosure is similar to the description of valuation processes in the Fair Value Expert Advisory Panel’s report in October 2008. When Will the New Requirement Be Effective? IFRS 13 is effective from 1 January 2013. Early application is permitted. The board believe that IFRS 13 will help increase transparency when entities use models to measure fair value, particularly when users need more information about measurement uncertainty, such as when the market for an asset or a liability has become less active. Providing additional information about Level 3 fair value measurements to users of financial statements will help confidence in those improve measurements. This Update represents the continued development of guidance related to fair value measurements in U.S. GAAP. Statement of Financial Accounting Standards No. 157, Fair Value Measurements, was issued in 2006 and has been amended by several FASB Staff Positions as well as several Accounting Standards Updates since being codified as Topic 820 in the FASB Accounting Standards Codification (ASC). The amendments generally represent clarifications to Topic 820, but also include some instances where a particular principle or requirement for measuring fair value or disclosing information about fair value measurements has changed. 1. The concepts of highest and best use and valuation premise in a fair value measurement should be applied only when measuring the fair value of nonfinancial assets. 2. Similar to comparable guidance for liabilities, the fair value of an instrument classified within a reporting entity’s shareholders’ equity should be measured from the perspective of a market participant that holds that instrument as an asset. 3. For fair value measurements categorized within Level 3 of the fair value hierarchy, a reporting entity is required to disclose quantitative information about the unobservable inputs used in the measurements. 1. Provided that certain criteria are met, a reporting entity that holds a group of financial assets and financial liabilities that exposes it to market risks and counterparty credit risk may apply an exception to the requirements in Topic 820, which permits the fair value of those financial instruments to be measured on the basis of the reporting entity’s net risk exposure. 2. Premiums or discounts may be applied in a fair value measurement to the extent that they are consistent with the unit of account and market participants would consider them in a transaction for the asset or liability. However, adjustments commonly referred to as blockage factors are not permitted in fair value measurements. For fair value measurements categorized within Level 3 of the fair value hierarchy: (a) The valuation processes used by the reporting entity; and (b) A narrative description of the sensitivity of the fair value measurement to changes in unobservable inputs and the interrelationships between those unobservable inputs, if any. The use of a nonfinancial asset if it differs from the highest and best use assumed in the fair value measurement. 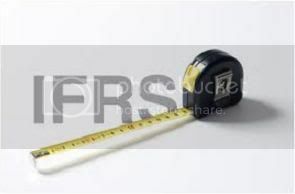 For items that are not measured at fair value in the statement of financial position but for which the fair value is required to be disclosed, the level of the fair value hierarchy in which that measurement is categorized. Since the fair value measurement guidance is about how to measure fair value rather than when to measure fair value, the Board concluded that the principles and concepts of Topic 820 are equally applicable to public and nonpublic reporting entities. However, the Board acknowledged that the relationship between costs and benefits related to certain disclosure requirements of this Update can differ depending on whether the reporting entity is a nonpublic entity. Accordingly, the Board concluded that certain disclosure requirements in this Update should not be required for nonpublic reporting entities, such as the requirement to disclose any transfers between Level 1 and Level 2 of the fair value hierarchy and the reasons for those transfers. There are some different disclosure requirements about fair value measurements. The most significant difference is that IFRSs require a quantitative sensitivity analysis for financial instruments that are measured at fair value and categorized within Level 3 of the fair value hierarchy. U.S. GAAP does not require a quantitative sensitivity analysis disclosure. There are different requirements about whether, and in what circumstances, an entity with an investment in an investment company may use the reported net asset value as a measure of fair value. The amendments in this Update are to be applied prospectively. For public entities, the amendments are effective during interim and annual periods beginning after December 15, 2011. For nonpublic entities, the amendments are effective for annual periods beginning after December 15, 2011. Early application by public entities is not permitted. Nonpublic entities may apply the amendments in this Update early, but no earlier than for interim periods beginning after December 15, 2011. Having the same fair value measurement and disclosure requirements will reduce diversity in application of financial, which will improve the comparability of financial statements prepared using IFRSs and those using US GAAP. IFRS 13 defines fair value, sets out in a single IFRS a framework for measuring fair value and requires disclosures about fair value measurements.